Mindy's fitness Journey: Time to show off! Giveaways Galore Continued! And the giveaways keep coming! Do you have a bunch of medals hanging around your house haphazardly? I have only been racing for a little over a year, but now that I have one half marathon under my belt and one to come this weekend, I decided that I needed a medal display. I really wanted it to be personal for me and my journey. I contacted Allied Medal Displays and asked them if they would be interested in being a part of this Giveaway Extravaganza that I am having celebrating all of you following my journey. Joe Exe immediately contacted me back and said he would love to give me one and allow me to give one away to you! Wow! I was so excited!!! The best part about Allied Medal Displays is that they allowed me to do a custom order. So of course, I asked for Mindy's Fitness Journey. I couldn't decide which running picture to put on it. Joe said that if I had a logo he could put it on there. Whoa! How cool is that! Do you see me flipping a tire? He made it seem really easy too! Wouldn't you love to create your own medal display! If you notice, I have room for a ton of medals! I know that I will be running lots of races and I will fill this up soon enough. Allied Medal Displays are really a fantastic idea, before I discovered them I had my medals hanging on a random door knobs throughout the house. I wanted something more sophisticated to display my medals on and I wanted something that would really represent me! What do you think? Don't you love it! You don't have to be a runner to order one of these. They make them for runners, triathletes, baseball, volleyball, dancers etc... one of the other great features about these displays is that they are super easy to hang up on your wall. They come with very easy to follow instructions as well as all of the necessary items (ie. screws, nails etc) needed to hang them. 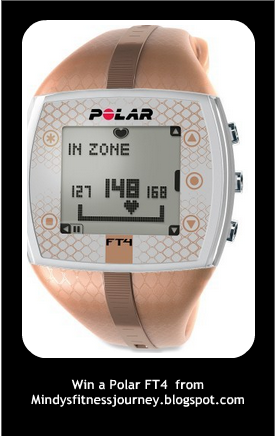 Remember that the Polar Heart Rate Monitor Giveaway ends tonight at Midnight!! Enter below in the rafflecopter to get your very own Allied Medal Display! The winners of the Shubeez have been chosen and notified. If the prizes aren't claimed in 48 hours, new winners will be chosen! The winners of the 26.2 are Laurel Cedarblade and Maureen. And the 13.1 goes to Dawn Rushing. If I won the medall display, I'd really want it to say RunYogiGirl. The one I have needs a friend since I'm running again. I am inspired daily by my own personal limits and wanting to push them as far as I can. WHOA! That's a whole lot of givwaways going on! It's a Giveaway Extravaganza Love the medal display! It be cool to have a Run DMT one. I am just monopolizing this. I want the pink braided yoga necklace. I totally want a personalized one too! I am inspired by speedy runners! I would want one with what I saw is our Family Motto. "Cryblskey's Never Give Up" especially since I put my kid's medals on the hanger also. I like the Runner (winged foot) display because it looks like the Digital Running Logo! gorgeous weather inspires me. feeling healthy inspires me. I would love to have the 50 states-50 half marathon display since that is my goal! Love the purple live your dream necklace! I'd get my blog name! I would get the runner (female) hanger. I would love the Runner with the girl image. I would love any gift!!! I love what you are doing and the dietbet! 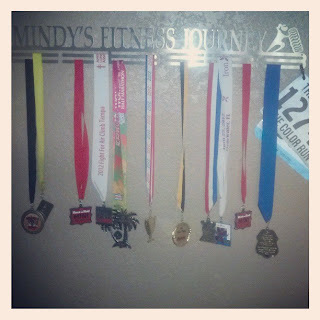 I like the Runner Girl medal hanger or Marathon Maniac Divas. I like the purple live your dream necklace. I would pick the Cityscape 2.0 female medal holder. I like the RUNNER GIRL or the BELIEVE... love them! I love my Allied Medal hanger! It says run with heart :-) I would definitely love to win one for me RP! I absolteuly LOVE the medal hanger that says " Give A Girl The Right Pair Of Shoes and She Can Conquer The World". How true! I would love to have the runner girl medal hanger! I would love to have the run dumbbell necklace. I focus on both running and lifting so this would fit me! Super cool! I would get a custom medal hanger with "My Fascinating Life" in chunky letters on top :) Also love the triple hanger feature. wow those are nice displays, if I won one I would want it to say ULTRA WOMAN but then on an after thought I would get the Archery one for my youngest Daughter Montana who has more Archery Medals than I had triathlon medals when I was 13 years old! I think I'd like a custom "Asthmarathon Man" hanger, but of the designs they have, I like the Louisville and generic cityscapes. Thus far, Louisville's home to my 1/2 marathon PR! I'm going to need something nice for the 6 Dopey medals! I just completed my fifth half marathon and have done a few other distance races over the past few months. My collection of medals is adding up - so a hanger is definitely in order! I love this medal display: Always Earned Never Given - Female! If I win, I would like the Display with my own phrase, which would be "I can, I will, I am"
My family is working together towards getting healthier and running 2 half marathons together this year... I know just with my medals and the ones I hope to earn this year, this would be a huge help... and look awesome too! They definitely have the best looking medal displays. I like that you can buy add ons for when it's full too. I would love a custom display for my son so he can hang his medals on it. I would love to win one of these gorgeous displays! My race bling is adding up and my simple homemade display (painted wooden dowel with ribbon tie) is getting filled up. I really love the pink Runner Girl medal display! Right now I have my medals stuffed in my drawer, not very glamorous. Thanks for the chance to win! I am always inspired by anyone who gives their all to live a healthy, fit and balanced life. I love following blogs such as yours for a peek in your lives to see how you all do it. I really love the purple Live Your Dream necklace from FitMissFitness. Very pretty. I love any of the Live Your Dream necklaces. I'd love to give my husband a medal display. He did 5 half marathons last year. It would be such a cool Father's Day gift. I love the Give A Girl The Right Pair Of Shoes and She Can Conquer The World medal hanger. Kind of hard to choose from all of the great hangers! They all look awesome. I'd either go with the Custom one (if possible) and get "Kid Inspired, Father Approved" or I'd go with the Male Runner or Male Runner Cityscape. The thing that inspires me the most is my family. My fiance and our 5 children! I like the "always earned, never given" medal hanger. I would love either the "Believe" or the "Pain is Temporary, Pride is Forever"
Decisions, decisions! I have no idea which medal hanger I would ultimately decide upon but I really need one! I would choose a custom design hanger...need a good place for my medals! I'd also do a custom design...these are SO awesome! I would love to have a custom designed one with a scripture verse address on it! For the medal display, I would get my dad the 50 States Marathons display. He is more than half way through this goal of 50 states.